Talking strictly as a collector, these three issues of Amazing Spider-Man have long been a curiosity for me because they were the first Marvel comics to not feature the seal of approval from the Comic Code Authority on the front covers. Prior to this arc, the Comic Code would not “approve” a comic with its seal if it featured questionable content – in this case, overt references to drug use (despite the fact that the message of the storyline was clearly anti-drug). Stan Lee took a stand and stuck with his storyline without an official “seal,” which in turn, bumped up the value of these three issues. Soon after, the Comic Code went on to revise its policies as a direct result of this storyline. So getting my hands on these issues was always a priority of mine (you can read about my experience grabbing ASM #97 here), because these comics are so historically significant. But beyond its historical significance, this storyline is also a very good one, and a legitimate candidate for any Spider-Man-centric “top 10” list (not to mention a list that focuses exclusively on Green Goblin stories like this one). 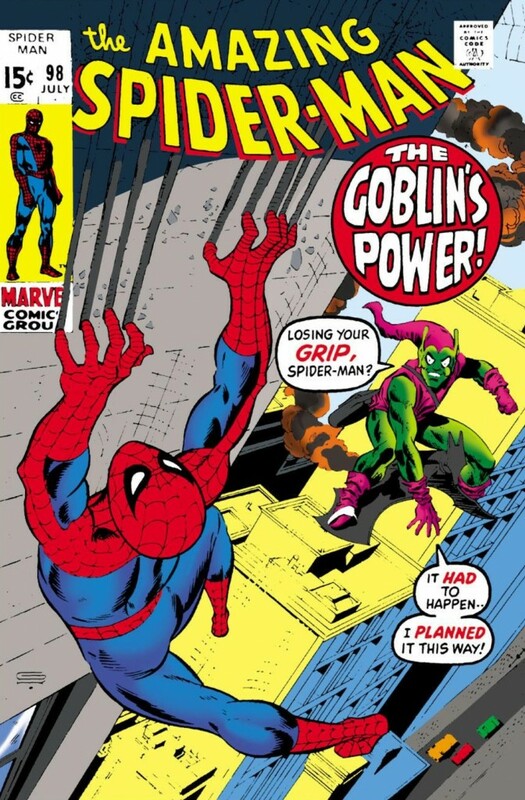 In fact, the only reason this arc hasn’t earned a higher place on my Green Goblin list is because the Goblin, while critical to the storyline’s central conflict, is not necessarily the driving force behind the arc’s larger drama. That’s not to say the Green Goblin’s presence isn’t felt through these three comics, but he’s more of a looming specter than a constant physical antagonist. He only appears on one page (beautifully illustrated by Gil Kane, whose pencils are unquestionably enhanced by John Romita Sr.’s inks) in ASM #96; crashes the Harry Osborn/Peter Parker drama in ASM #97; and has his fight with Spider-Man in ASM #98 (which is nowhere near as epic or dramatic as some of the preceding Spidey/Goblin fights). Instead, the meat and potatoes of this story is its broader anti-drug themes, which are still quite topical in the wake of shocking news reports, like the recent death of actor Philip Seymour Hoffman. In these issues, Peter, who is still smarting over Gwen leaving him to live with family in London after the death of her father, learns that his “best friend” Harry has a tendency to pop pills when the going gets tough. After Harry’s sorta/kinda girlfriend Mary Jane makes a move on the newly-single Peter, Harry turns to a dealer to get an even stronger fix. The drugs cause Harry to act manically, getting into a fight with Peter over MJ before eventually making him ill and sending him to the hospital. In the background, Norman is becoming paranoid and deranged again (similar to what we saw in Spectacular Spider-Man Magazine #2) and he becomes the Green Goblin. When he goes to attack Spider-Man as Peter, he sees his drug-addled son passed out in his apartment, and he recoils in horror. 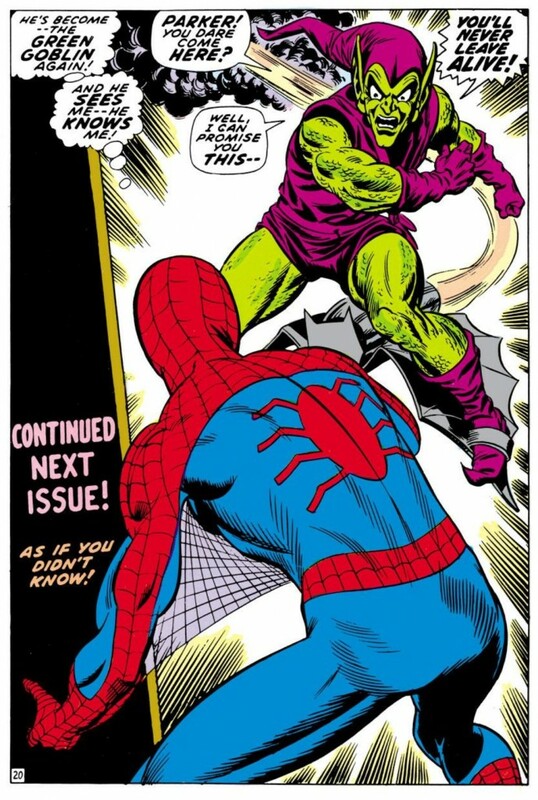 This theme is revisited again in ASM #98 when Norman attacks Peter with a barrage of pumpkin bombs (including one that saps Spidey of his ability to stick to walls) and in a last ditch effort, Spidey jumps on the Green Goblin and “steers” him towards the hospital so he can see his sick son, causing him to become regular “Norman” again. To be honest, the material involving Harry, and Norman’s repulsed/concerned/bewildered reaction to his son is so powerful, the actual Spider-Man/Goblin fight reads like immaterial to me – just a sequence of events that fill up a few pages before we get to the “good stuff.” I think the creative team’s decision to make Harry the “user” for this storyline is a stroke of editorial genius. Harry the drug addict not only parallels his father’s mania and addictive personality (what would you call Goblin Serum if it’s not a drug? ), but it also speaks truth to a larger social message found throughout the arc: that anyone, regardless of race or wealth, can fall prey to drug addiction without much warning. 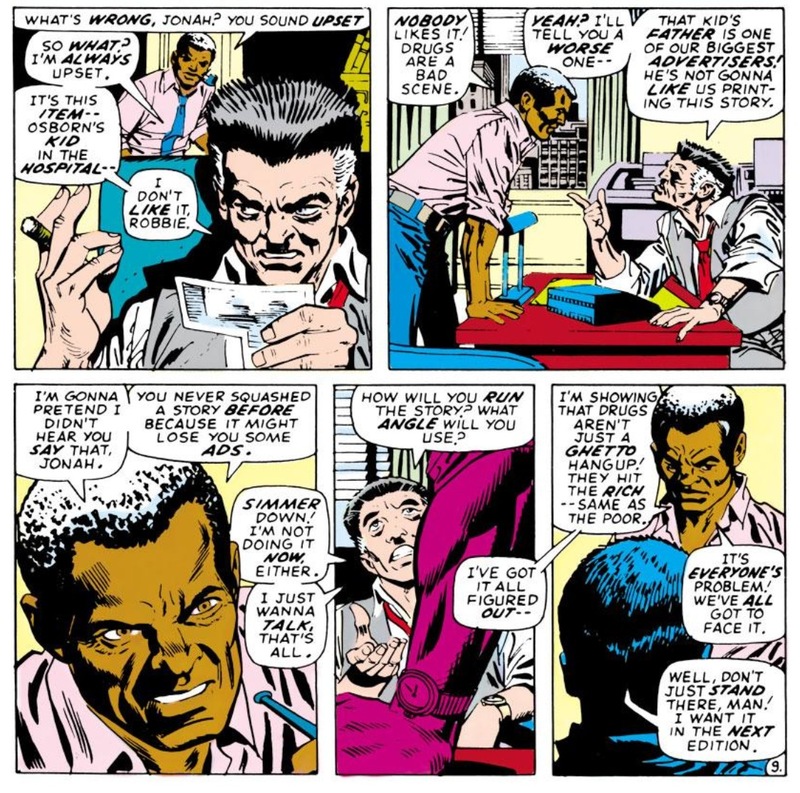 There are a few occasions – including a scene between J. Jonah Jameson and Joe “Robbie” Robertson – where Lee’s script hits us over the head with its social message, but it doesn’t change its truth, or how bold Marvel was for using three issues of Amazing Spider-Man to tell us this story. Additionally, this storyline completely changes the dynamic between Peter and Harry, and sets the table for events that would come after Norman’s death in ASM #122 that would truly drive a wedge between their friendship (like Harry becoming the Green Goblin). Prior to these issues, Harry had always been portrayed more as a Jughead or Reggie to Peter’s Archie – a teenaged rival/friend that wasn’t terribly complicated or interesting. Now he was someone with ugly demons that would go on to transform his personality. ASM #96-98 made Harry a richer, more complex character; someone who was intriguing to watch every time he made an appearance in subsequent issues. 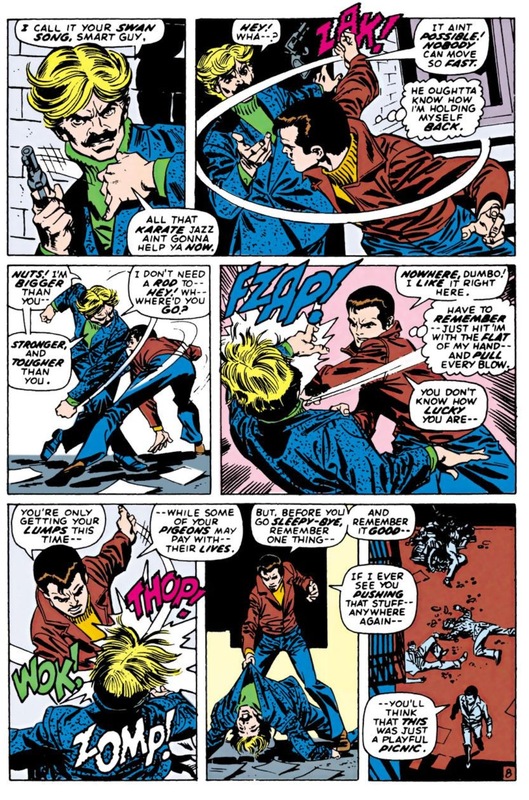 Harry’s character evolution also adds an extra layer of drama to Peter’s (out of costume) confrontation with Harry’s drug dealer in ASM #98. 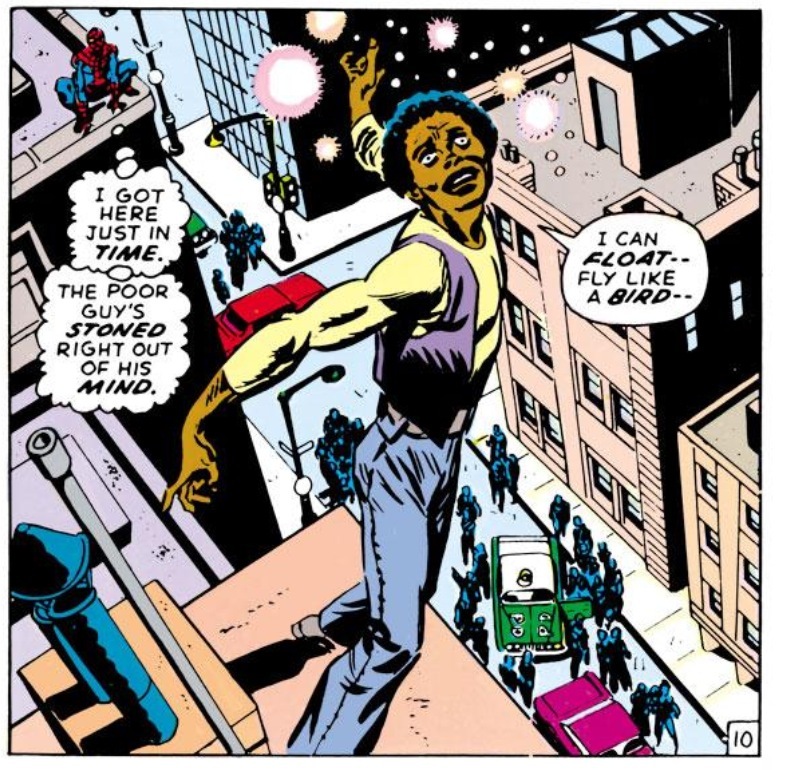 Prior to this arc, Peter was notoriously cautious about demonstrating his speed and strength while operating as “regular” ol’ Pete, and while he does hold back a bit in this one scene, he does enough to physically convey his message to these dealers that Harry Osborn is off limits. Despite how Harry turned on him, Peter still believes that the two are best friends, and is willing to risk outing his secret identity in order to protect him. As an added bonus, Peter’s confrontation with the dealers demonstrates how he’s willing and able to protect Harry in ways that Norman is oblivious to. So not only does this storyline mark a change in the Peter/Harry dynamic, but also the Harry/Norman and Norman/Peter relationships. The complexity of all these relationships has led me to conclude that this storyline more appropriately marks the transition from the glossy Silver Age of comics to the grittier Bronze Age. Many historians always point to the “The Night Gwen Stacy Died” as the “official” turning point from Silver to Bronze, but there’s a hardened edge to not only how Peter and Harry interact, but how all of these characters relate to each other. 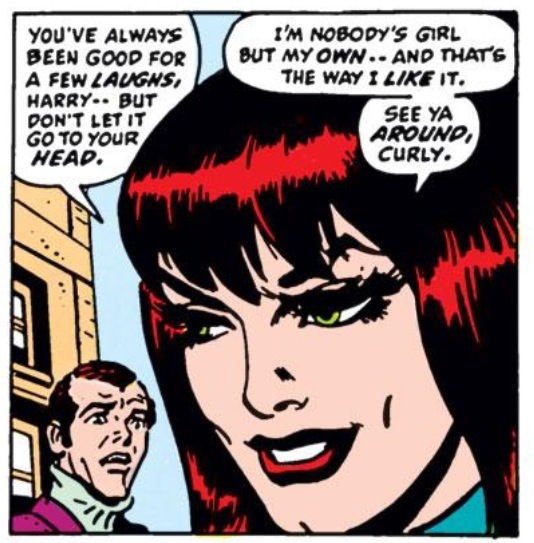 Mary Jane who has long been the group’s “party girl,” lashes out at Harry (with a smile, of course) for claiming any kind of ownership over her romantic life. Spidey is even more recalcitrant than usual to strike back against Norman because the wounds of Captain Stacy’s death are still fresh in the series and Peter doesn’t want to see another friend lose a parent. Oddly enough, the only character that seemingly remains stuck in the Silver Age in this storyline is Gwen. 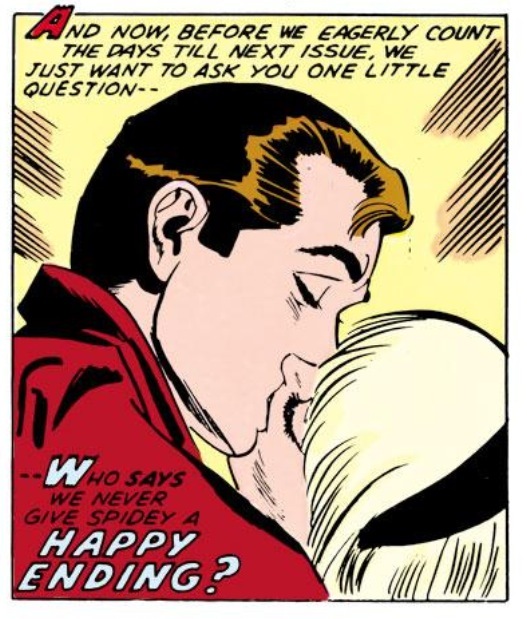 Her reunion with Peter at the end of ASM #98 is advertised a rare “happy ending” for Spider-Man, but in retrospect, the moment smacks as the beginning of the end for the character. While Gwen is mourning the loss of her father in London, things are changing rapidly in New York. There’s Harry’s drug use, MJ’s indirect endorsement of free love and Peter trying to make sense of it all. Then, out of nowhere, Gwen is back in his arms, as if the heated argument the two had about Spider-Man’s role in her father’s death never happened. Gwen’s characterization lacks any kind of inertia, and sadly wouldn’t regain any until her very tragic death less than 25 issues later. That, of course, is a post for another day. Well written. I agree that was probably the end of the silver era. Great post. Agreed, even though the setting has evidently aged a bit, this is one of the very best ASM arcs. As far as the Silver Age, although I’d still consider #121 its unquestionable, official ending, it’s hard to deny this is a close second. Gil Kane’s art is at its best, I think. These three issues can be appreciated to their full in IDW’s Artist Edition. The oversize makes Gil’s art even more beautiful. LOL, yet another flaw in that awful story, though there were a few preceding issues before Norman came back when Gwen was in London (one issue if memory serves). Sounds like guilt to me. *Sigh* That’s the thing with continuity it can be stretched out and retconed into anything the author desires. So 5 or so issues of Pete and Gwen being apart which could have been very well equal to 1 month comics continuity at the time is now interpreted as 7 or 9. One thing I have to argue about “Sins Past” it did (oh it pains me to say this….) give Gwen some depth and a character evolution that made her kind of interesting from the standpoint she wasn’t this innocent vixen anymore, but it still doesnt excuse what Marvel did to achieve this. Nice article. I would have ranked these classic issues higher, but it’s your list not mine. Really well written. You make a good argument for these issues marking the end of the Silver Age.